At this time of year, it is often necessary to supplement the natural nectar that bees are gathering with sugar syrup. They are able to make honey out of this syrup and it ensures that they are able to store enough honey for the winter. 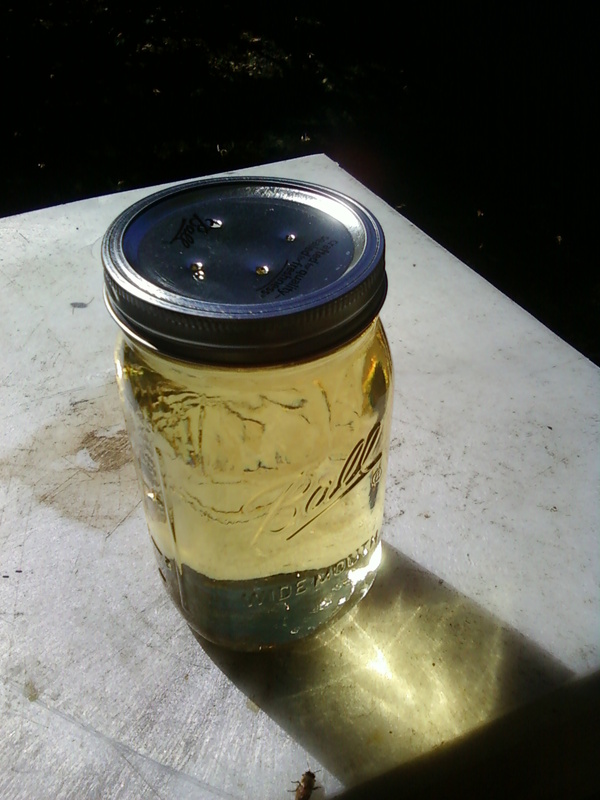 Beekeepers feed with a 2:1 sugar:water syrup. We determined that our bees at Temple didn't have the amounts of honey that they needed at this time of year to last through the winter, so we needed to feed. As often happens in many of my cooking/craft/gardening projects, the first time I tried it, I did it wrong, so I had to fix my syrup. I'm fine with this- I think it is valuable to learn from your mistakes! Rather than actually working out the proper ratio, I did a quick google search to figure out the dry weight to liquid ratios... google was wrong. I mixed 10 pounds of sugar with 5 cups of water and created a really really thick syrup. Granulated sugar, the main ingredient for bee food... those little sugar addicts! 10 pounds sugar mixed with 5 cups of water... waaaaay too much sugar. Since the mixture dissolved and it stayed liquid overnight, I thought I had gotten it right. Syrup packed in mason jars, already looking a little too thick. During the drive from my house to work (approximately 12 minutes), the mixture totally solidified so I knew it was back to the drawing board. I brought it back home that night, re-melted it and added another 5-6 cups of water. Then I re-poured the liquid into the mason jars. 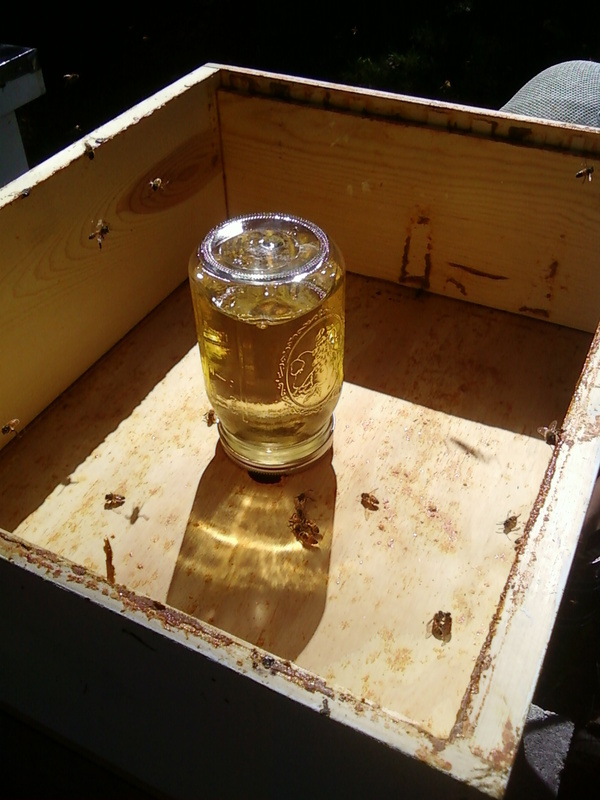 It stayed in a liquid form, so we punched 4 holes in each jar and placed them over the hole in the inner cover in each hive with an empty box around them. This allows the bees to reach it from inside their own hive and they won't be competing with other bees for the food. 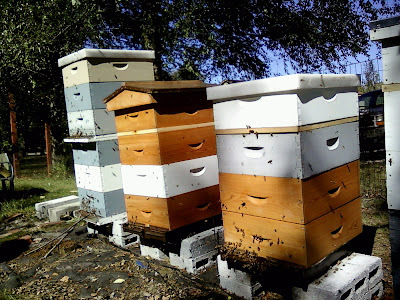 Then we placed the top cover on and let the bees enjoy the feast. Four holes in the jar lid to let the feed drip out when inverted. Inverted jar on top of the inner cover hole surrounded by an empty box. This will be covered by the outer cover. 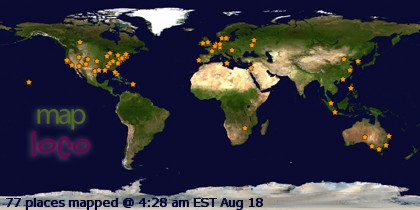 We will check and refill the jars every few days because the hungry girls will go through it quickly. After I did all of this, Vince told me that I shouldn't have heated the syrup. Heating can form particles that the bees can't digest. 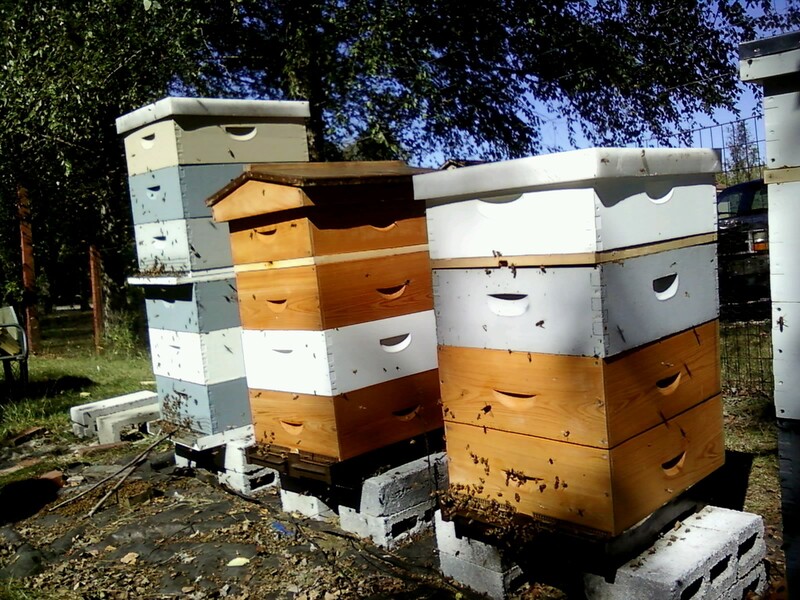 This isn't a big problem as long as the bees are able to leave the hive to use the bathroom. But when they are trapped in the hive "holding it" for months at a time over the winter, it can seriously harm them. He said that next time I should pour boiling water into the sugar off of external heat. The hot liquid will melt the sugar and not cause the formation of the unsafe particles. Sorry girls, next time a more healthy meal awaits! So what is the proper quantities of sugar and water to get a 2:1 ratio? Volumetrically I use 2 cups sugar to 1 cup water but it bothers me that sugar is a solid measured in pounds and water is a liquid measured in liquid ounces. I've forgotten enough of my chemistry to know how to make a 2:1 solution of solid to liquid. From more googling, I found that a cup of water weighs about a half a pound, so I used 10 pounds sugar to 10 cups of water for a 2:1 ratio for my heavy syrup. Next time, I won't be so lazy and I'll actually pull out my kitchen scale to check this.